Syria is a popular location of pilgrimage and tourism, home to six World Heritage sites including the Citadel of Aleppo. The country has some of the earliest cities built in human history stretching back at least 2000 years. Most importantly for Muslims and Christians, it is host to shrines of influential religious figures such as Prophet Mohammed’s (pbuh*) granddaughter, Sayyeda Zainab, and the tombs of Adam and Eve’s sons, Abel and Cain. Visiting a religious area always comes with strict rules. Before entering the shrines, visitors are expected to remove their shoes and cover their heads as a sign of respect. Islamic belief states that once a body has been buried, it is forbidden to dig up the remains or walk over the grave because it is disrespectful to the dead. Rebels involved in the civil-turned-sectarian war in Syria have ignored these very basic Islamic and moral principles. All six World Heritage sites have been damaged in the midst, and with over 90,000 people already dead and counting, not even the deceased are spared in this conflict. Muslims around the world were outraged when the Free Syrian Army (FSA) destroyed a revered shrine near Damascus. The FSA support the Salafi sect within Islam and believe that shrines in general – whether Christian, Muslim, Buddhist or Hindu – are idolatrous. Members of the Salafi movement are responsible for the destroying of shrines around the world including Libya, Egypt and Mali, and the ideology is rapidly spreading in Syria. This revered shrine located in Adra, a small town north of Damascus, was that of Hujr bin Adi, a close companion of Prophet Mohammed (pbuh). Hujr was a strong supporter of the Prophet’s son-in-law, Imam Ali, and fought in several battles alongside Ali to protect his leadership, including the Battle of the Camel in 656 AD. Hujr was later punished for this loyalty and given the option to have his life spared if he were to denounce Ali in public, but he refused, and both he and his son were killed. As such, he is believed to have died a martyr. For Muslims, his legacy signified loyalty and piety, unhindered by the consequence of death. His shrine was visited by millions of Muslims every year. 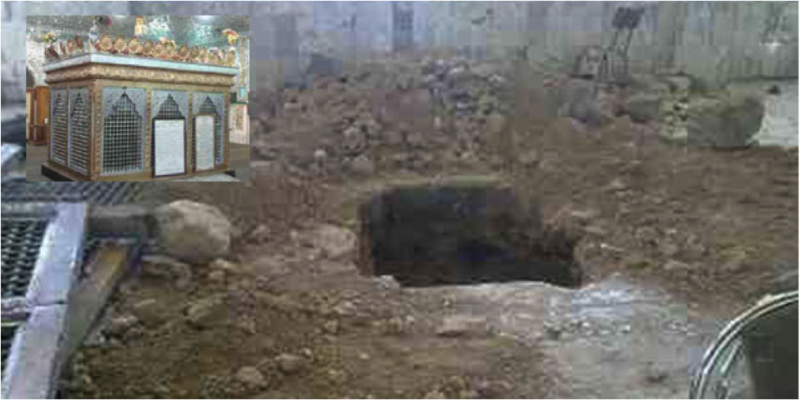 On 2 May 2013, Hujr’s shrine was destroyed, his grave dug up and his body exhumed. The body had been taken and buried in an unknown location. According to eyewitnesses, one of the members of the FSA took a photo of the body with his camera phone. By 6 May, the photo was on every major Islamic TV channel and many Muslims were shaken by what they saw. At first view of the face in the emerging mobile phone photos, it would seem as though this man was buried just yesterday. To put this in perspective, only three months ago King Richard III’s skeleton was found in a council car park in Leicester. King Richard died 528 years ago, while Hujr died 1353 years ago. For some Muslims, this would fit the ideology that Hujr’s body remained in tact due to the special privileges of martyrs. The Qur’an and other Islamic scriptures describe life after death and the state of the body while in the grave, whereby depending on a person’s beliefs and actions throughout their life, a grave can become a torture cell or a haven until the Day of Judgement. However, martyrs’ bodies are believed to be intact and, literally, do rest in peace. 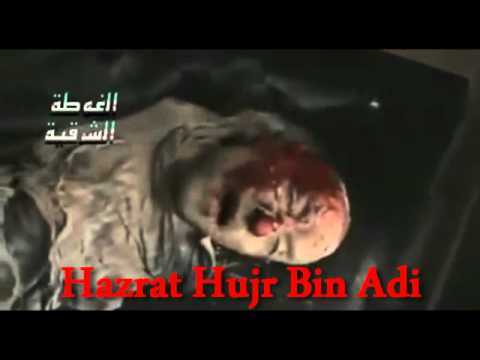 If this is Hujr’s body, it confirms Islamic beliefs and the circumstances surrounding his death. There is, of course, the possibility that the body does not belong to Hujr. It could be the body of another victim or fighter in the war. Perhaps this person defended and fought against an oppressor, just like Hujr did so many years ago, or perhaps he didn’t even have that opportunity. Either way, the exhumation of the body depicts the harsh, underlying patterns of the events in Syria and in other parts of the world, where heritage and religion are under attack. In acts like this, there are virtually no moral or ethical boundaries. Muslim countries around the world have expressed their disgust at this incident. In response, there have been protests by predominantly Shia communities in Iran and Iraq. The Iranian government has also released a free eBook about Hujr and plans are underway to release a film about his life. The response of Muslim countries seems to be inspired by Hujr’s peaceful resistance. The fighters in Syria would do well to adopt the same. Zahra Shah is an English and Drama graduate currently working as an editor for an e-commerce company.